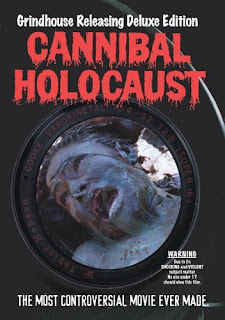 The Horror Digest: Cannibal Holocaust: Not a Good One to Watch While Eating Rat Kabobs. I think the main issue people have is that the animals were killed for the movie, while the footage was just used in the movie., but you are right in that a lot of people may over look this particular part, possibly because they don't realize it may be real or that everything else simply overshadows it. It's not an indicator of anyone's character--just the sheer brutality of the film in general. Maybe it's just the fact that blood and gore is so commonplace, but I didn't find this one SO bad. I mean yeah, my jaw dropped at the animals, but that's almost definitely due to the fact that I had read this post, and knew that they were real. The basic story is that modern civilization meets savage, and the modern one is the actual monster. It's the same basic plot as fern gully, pochahontas, dances with wolves, avatar (sigh...) and they all did it better. Even Avatar. I guess you could argue that CH came first, but... meh. I would suggest watching The Gods Must be Crazy, and skip CH. On the plus side, though, I DID find the scene with the impaled chick to be quite powerful. Not the chick, but when the cameraman says "Hey, watch it, we're filming!" and the dude has to force himself to stop grinning. Well I think that people mainly watch this to get disturbed. I don't think anyone is going into it with a hope of it being a great commentary on anything. Sure they might come to that conclusion after the fact but the main driving force is always going to be the shock value. For me it's the brutal realness of it all. It just feels real to me, and not just like the same old blood and gore. Something has always felt very wrong when I watch this, and that has always freaked me out.